Verbal autopsies in India: Million death study is improving public health. Why “verbal autopsies” are changing public health. 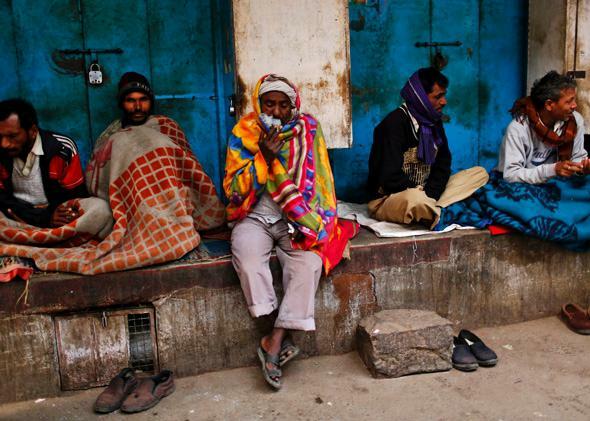 Laborers on a cold winter morning in the old quarters of Delhi. Poor Indians are more likely to live outside the health care system, making it hard to know causes of death. Relatives of the recently deceased are helping to pin down the causes of deaths in India and boost public health, says Prabhat Jha, professor of epidemiology and public health at the University of Toronto in Canada. He is also founder of the Centre for Global Health Research at St Michael’s Hospital in Toronto, through which he leads the ongoing Million Death Study in India. You are conducting a million “verbal autopsies” in India. What are they? The idea is to ask people in a simple way what happened to their family member who died, and they describe patterns that doctors can use to infer the cause of death. This approach has been used on a small scale to categorize children’s deaths in India and Bangladesh since the 1970s. For this study we extended it to include adult deaths at a national scale. What inspired you to investigate adult deaths? The vast majority of the 10 million deaths in India each year occur outside the formal health care system. They aren’t medically certified—and we are left with very little information on how people died. Where did verbal autopsies originate? A very early kind of verbal autopsy took place in 17th-century London, when John Graunt sent teams to people’s homes to compile lists of deaths. These lists showed that there were far fewer murders than commonly feared, and instead many of the deaths were from tuberculosis and childhood conditions. For his later work on cholera in London, John Snow often gets credit as the first epidemiologist, but it was John Graunt who laid the basis for understanding the causes of death. India is a vast country. How have you set up the infrastructure to conduct a million interviews? The Indian government already had a system in place in which, every six months, they selected homes randomly from all over the country and sent teams in to monitor births and deaths. They would knock on the door and ask, “Has anyone died? Was anyone born?” But they did not get any reliable information on how people died. We wondered if we could add a verbal autopsy to this process. What has been the response to the interviews? At first the staff asked to do them were resistant. They thought you needed to be a doctor. But we showed them that they could get useful information just by listening respectfully and writing down, in the local language, a half-page narrative of what people said. The families are very cooperative. Even with sensitive things like suicide or AIDS deaths, people are still willing to describe what happened. Part of it is having someone listen to grievances they may have had about the lack of health care, for example. We also tell people at the outset that they’re not going to get any benefit, but that they might help the community to better understand the causes of death. I think they respect that honesty. What happens to the interview narratives once they have been collected? The narratives are randomly assigned to two of 350 trained physicians, based on which local languages they can read. They both look through the narrative, highlight key sections and words and submit a diagnosis. If they disagree, the diagnosis is adjudicated by a senior physician. What are the limits to verbal autopsies? The main limitation is that you can only really diagnose broad categories of disease—but that’s good enough for public health purposes. For example, I can tell you that someone, like my grandfather, died of a stroke, but I can’t say whether it was hemorrhagic or ischemic. The system works well in early and middle age, but not in old age, where concurrent medical conditions can confuse diagnosis. What are your most important findings so far? As well as finding a far higher death toll than expected linked to smoking in India, we estimated that there were 200,000 malaria deaths in Indians younger than 70 during 2005. For that year, the World Health Organization had estimated about 15,000 malaria deaths in India. The WHO’s numbers are based on properly diagnosed patients, but because you can cure most malaria, anyone you diagnose is very unlikely to die. Meanwhile, many acute fever deaths were and are going undiagnosed. How have people reacted to such findings? The malaria numbers were very controversial. The main criticism was that we don’t know whether it was the malaria or some other infection that killed the person. And that’s absolutely true, because we didn’t have microbiological confirmation. We’re starting to work with mortuaries to do that now. But the presence of acute fever deaths was unambiguous. We were consistently finding a person who was otherwise well, then suddenly had an acute fever and died. The number of diseases that can kill in this way is reasonably limited, and these fever deaths also correlated with the known geographical distribution for malaria. It’s still controversial, but the numbers are just too big to be explained by some of the criticisms that were thrown at it. Could verbal autopsies be used in other countries besides India? Many more countries could implement verbal autopsy, including most African countries. Of the 50 million or so deaths each year in low- and middle-income countries, the number for which there is good information on causes of death is trivial. Only 3 percent of the world’s child deaths—most of which occur in developing countries—have a cause of death certificate. The rest is guesswork. To understand whether efforts to reduce child mortality have been a success, you need to know the cause of death. For example, if mosquito nets are working well for malaria control, you should see a reduction in fever deaths in children. Will you stop after recording a million deaths? No. India’s approach to large projects has been described as an elephant—once it is moving, it just keeps going—so verbal autopsy will continue. We’re now looking at the health care system as well. Take tuberculosis: Mumbai has far more deaths than you would expect for a reasonably affluent city. So now we’re working with the local government to investigate why people died of tuberculosis even though treatment was available. In the era of large-scale global health models, why is it so important to track individual cases? We need global estimates and models of disease, but they are only as good as the data feeding them. Counting the dead is a simple, powerful idea. We’ve shown it can be done on a national scale, at low cost and high quality, simply by talking to people. Improving this basic information on cause of death yields a big return on global health.